The LA Times and now some other sources have quoted me criticizing the BDCP's claim of a million jobs protected by building the tunnels, because it is based on a "fictional scenario." These press reports do not explain why I said it is a fictional scenario, so I will do it here. The jobs claims from BDCP are divided into 2 parts, as shown in this BDCP infographic. The first part are those created by the direct spending on implementing the BDCP (building the tunnels and habitat). This part of the analysis is well-done and estimates 155,090 years of employment, primarily from construction. The fictional scenario is the second part: the claim of nearly 1 million jobs (years of employment) from water supply reliability. The calculation depends on 3 far-fetched assumptions, all of which must be true to generate the level of water shortages that drive this kind of job impact. Water agencies don't invest in any new alternative water supplies for the next 60 years beyond what is under construction today, and there is virtually no increase in active conservation beyond current levels. The Brattle Group says alternatives are speculative. I guess it is speculative to assume that water agencies would do anything crazy like actually follow their own board-approved investment plans! Metropolitan's own long-range plan specifically lays out what they would do over decades to ensure no water shortages even if there is no Delta solution and environmental regulations cut water supplies further. It only takes this one ridiculous assumption to make it a fictional water shortage scenario, but wait there's more. Water demand in Southern California urban areas grows by 20% over the next few decades, even though there has been no growth in demand for the past 20 years. This projection uses outdated and inflated population growth forecasts instead of following California law and using the Department of Finance population forecast as is required for state level planning activities. Population growth is expected to be slower and development more dense in the future than it has been in the past 20 years of flat demand. These types of water demand growth forecasts have been made by the water industry for decades to rationalize big projects and they have always been wrong. This one is no different. Increased environmental regulation reduces Delta water exports by another 25%, as soon as 2025. I guess they think the Environmental Water Caucus or Restore the Delta will be running the State Water Project control room in a decade. Of course, the shortage wouldn't happen even if the state implemented these advocates' "Responsible Exports Plan", because their plan calls for large investments in alternative water supplies and conservation with the money not spent on BDCP (see assumptions 1&2 above). Although I increasingly think this "Responsbile Exports Plan" is the best plan on the table, it is wildly speculative to assume that is the current direction of policy. The current, much less protective levels of regulation are under attack in Congress and the courts, often by the same interests promoting the BDCP. Finally, I will note that the good part of the analysis that estimates 155,090 jobs (years of employment) is not very impressive given the cost. If you divide by the $25 billion cost of BDCP, that amounts to only 6.2 jobs per $1 million of public spending. Anyone familiar with employment multipliers should recognize that is an incredibly low total of employment for that level of spending. The bottom line is that spending billions on imported tunneling machines and converting farmland to marsh just doesn't produce that much job bang for the buck. Last week, BDCP released what it describes as "cost and yield information," although I didn't see any new information in the glossy newsletter summary with the pretty bird. The newsletter makes 2 main claims: 1) BDCP provides reliable water for $5 per month, and 2) BDCP is cheaper than the alternatives. Both of these claims are deceptive and are based on invalid comparisons and inaccurate assumptions. I'll start with the second claim, BDCP is cheaper than alternative water supplies, which is illustrated in the BDCP glossy with this graphic. I see six major problems with these comparisons. Subsidized BDCP costs are compared to unsubsidized alternative costs. However, the proposed water bond subsidizes both BDCP and these alternatives. According to BDCP, water agencies would pay 68% of BDCP's estimated $25 billion cost, and most of the rest would be paid by state water bonds. While the agencies would pay all the cost of the Delta tunnels, the public subsidy of BDCP includes things essential to securing an endangered species "take permit" for the Delta tunnels, including billions for habitat construction projects and purchasing water from upstream sources to augment Delta freshwater in-flows which would be greatly reduced by the tunnels. 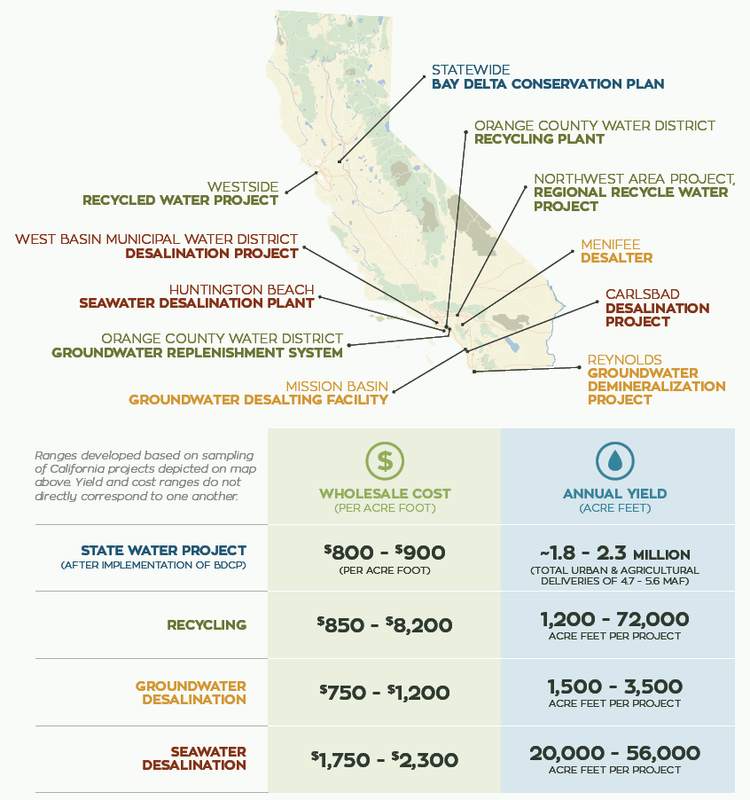 My understanding is that the current water bond proposal has more public funding for these alternative water supplies like recycling and groundwater cleanup than BDCP projects. Thus, if the costs of BDCP to water agencies are displayed assuming water bond subsidies, then the alternative costs to water agencies should also reflect subsidies that would result from the same water bond(s). BDCP costs are reported as the change to the average cost of a large system with existing projects (i.e. State Water Project) whereas alternative costs are reported at the project level. A consistent comparison to the alternatives requires BDCP costs per acre foot to be calculated at a project level (i.e. marginal costs), which means looking at the increase in water supplies from implementing the project. The BDCP cost figure deceptively averages the cost over all State Water Project supplies - including those that would be provided without the BDCP. 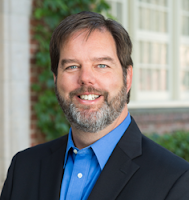 Dr. Rodney Smith has an excellent example of a correct calculation of BDCP costs for comparing to alternatives on this blog post. Dr. Smith states that "Under alternative “no tunnel” scenarios, the best case for the cost of BDCP water would be well over $1,000/AF for a non-firm water supply. There are some scenarios where the BDCP investment may yield even a lower water supply. In those circumstances, the BDCP investment in tunnels would become the “bridge to nowhere” in waterworld." It should be noted that Dr. Smith's "well over $1,000" is untreated water at the Tracy pumps and does not include the cost of treatment and pumping hundreds of miles over mountains to southern California cities. Uncertain BDCP costs and yields are compared to alternatives with known or much more certain costs and yields. The alternative costs in the chart are based on projects that are already built, under construction, more advanced in design and/or use existing technology. There is a lot more certainty about the costs of these alternatives. In contrast, the BDCP tunnels are only at 10% design and it is a unique project that presents enormous engineering challenges. Furthermore, the BDCP water yield is not known and is given as a range. BDCP cost estimates assume no cost escalation and optimistic yields. Thus, BDCP is much riskier than these alternatives. Alternatives are more reliable than BDCP. Unlike BDCP, these alternatives are relatively drought proof, whereas BDCP provides no additional water in dry years. For BDCP to generate comparable reliability, you would have to include significant costs of new storage which would raise the per-acre foot cost of BDCP water. Lower-cost alternatives are ignored. The comparison chart picks the high-cost, high-capital alternatives under the assumption that most of lower-cost alternatives like conservation have already been implemented or will be implemented anyway. Many experts, such as those at the Pacific Institute, disagree with this pessimistic assessment of conservation. It should also be noted that this comparison only looks at urban alternatives, when most of the BDCP water supplies go to agriculture. The simplest alternative for agriculture is to fallow lower-value crops, an action which is generally estimated to cost about $150 per acre foot. Ignores technological advance in alternative water supplies. While I don't fault the BDCP for not wanting to speculate about the cost of future technologies, it should be noted that the cost of these alternatives is dropping and there is a lot of technological innovation in the pipeline on water supply alternatives. As for the first claim, $5 a month for water supply reliability. $5 a month per household assumes that farmers pay the majority of the tunnel costs, which is widely known to be infeasible and this cost allocation issue is the main reason that even a draft BDCP finance plan is years overdue. There are also some unrealistic assumptions about no cost escalation, delays and financing terms embedded in this. I expect urban household costs to be about 3 times what BDCP estimates. BDCP water is not that reliable. Given the current drought, I think most people would not view a $15 billion piece of water infrastructure that is idle in drought years as substantially increasing reliability.